Espoo, Finland: – Medaffcon Oy, the Finnish arm of leading European integrated healthcare provider and pharma wholesaler PHOENIX group, is taking pioneering steps in utilising biobanks for research and real-world evidence (RWE) generation. Biobank research and RWE are increasingly used by the pharmaceutical industry for a broad spectrum of purposes, ranging from preclinical studies accelerating drug development to post-approval studies evaluating the clinical effectiveness of products during everyday clinical practice. Medaffcon, part of the PHOENIX group, is an ESPOO based company providing medical and health economic expertise. Medaffcon is the leading private-sector RWE provider in Finland and has been conducting biobank research since the establishment of the first biobanks in the country. To date, Medaffcon has carried out dozens of biobank studies in various research settings, promoting patient-centric and effective healthcare. 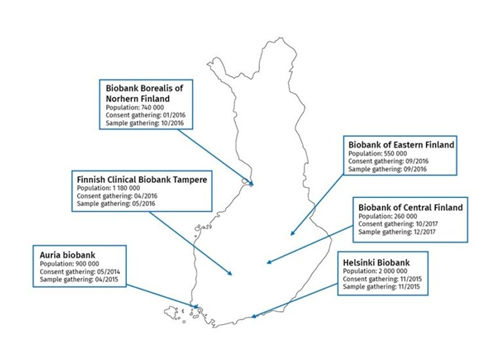 To showcase the activity and unique research opportunities offered by the Finnish hospital biobanks, Medaffcon has recently, in collaboration with the University of Eastern Finland, assessed the operational status and sample availability in the six regional biobanks. Special emphasis was put to define possibilities of the hospital biobanks to support the needs of international pharma and health technology companies. Outcome of the survey has been compiled in a report format (see Resources). Setting up a nation-wide biobank infrastructure that supports innovative approaches to study diseases and promote health and wellbeing has been an integral part of Finland’s Health Sector Growth Strategy for Research and Innovation Activities. To date, the Finnish biobank infrastructure consists of ten biobanks along with the legislation that supports the collection of samples and, with a broad consent, use of them for various research purposes. The report by Medaffcon describes how the six hospital biobanks, that currently store over 11 million diagnostic samples gathered from around three million individuals have created an internationally unique research infrastructure in Finland. Since the establishment of the first Finnish biobanks 2014 onwards, the number of biobank studies have increased at an accelerating pace. By the end of May 2018 there were close to 200 studies initiated that utilize samples and data collections at the Finnish hospital biobanks, including study initiators from both public (62%) and private (38%) sector. For more information and examples on the vast RWE opportunities provided by the Finnish biobanks to the global pharmaceutical industry, visit Future Care Finland platform (see resources), a website developed and maintained by Medaffcon. In addition to retrospective samples, collected before the Biobank Act took effect, all hospital biobanks are actively gathering new prospective samples from consenting people. By May 2018, close to 80,000 new samples had been collected. Along with the new sample collections, support from the hospital districts and expanding availability of genome information, the pace of initiating new biobank studies is expected to rise quickly over the coming years. Medaffcon proactively promotes the biobank research opportunities in Finland as detailed in the current issue of the magazine Biobanking in Finland & Personalized Medicine, viewable online (see Resources). While there are several biobanks in Europe, Finnish biobanking landscape stands out due to several unique features. These include Finland’s universal healthcare that provides a ground for unbiased data with excellent population coverage, use of the national id -system that allows linkage of data between different sources, such as national and disease-specific registries, as well as governmental support and legislation that enables the use of health data for research purposes. For these reasons Finland is a forerunner in biobanking activities also internationally. “We at Medaffcon see that Finnish biobanks offer enormous opportunities for the international pharma industry. We are excited to be part of this development and want to use our expertise in providing innovative solutions that advance healthcare and wellbeing of future patients”. The PHOENIX group, headquartered in Mannheim, is a leading pharmaceutical trader in Europe. Active in 27 countries, the company offers unique geographical coverage throughout Europe, making a vital contribution to comprehensive healthcare with more than 36,000 employees. The PHOENIX group’s vision is to be the best integrated healthcare provider – wherever it is active. The PHOENIX group considers itself to be a link between manufacturer and patient. Pharmaceutical manufacturers, pharmacies, doctors, hospitals, health insurance funds, and patients across Europe can benefit from our service offering. In pharmaceutical wholesale, the PHOENIX group is active with 164 distribution centers in 27 countries and supplies pharmacies and medical institutions with drugs and other health products. Numerous other products and services for pharmacy customers complete the portfolio – from assistance in advising patients to modern goods management systems to pharmacy cooperation programmes. With around 13,500 member pharmacies, PHOENIX Pharmacy Partnership is the umbrella for our European network of 13 cooperation and partner programmes in 16 countries. Pharma Services provides services across the whole supply chain for the pharmaceutical industry. The PHOENIX group already operates around 2,500 of its own pharmacies in 14 European countries, thereby having profound knowledge of the pharmacy business. Our approximately 18,500 pharmacy employees have around 140 million customer contacts each year. They dispense approximately 315 million drug packages to patients and advise them on issues concerning pharmaceuticals and general health. Further information about the PHOENIX group | www.phoenix-all-in-one.eu. Click on PHOENIX Medaffcon supports biobanking for other information. Click on PHOENIX group to contact the company directly. Click on Finland & Personalized Medicine Magazine to read digital edition. Click on Future Care Finland Article for overview of Finnish hospital biobanking. Click on Current operational status of the Finnish hospital biobanks to download the Medaffcon report.